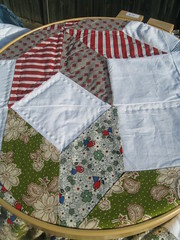 Every night I am working away on hand quilting the eight point star quilt. The first week was really difficult because I had to unlearn some bad habits and implement a new quilting technique. Two weeks later it seems natural and the stitches aren’t as wonky as they were in the start. Practice and patience seem to be the drill. Meanwhile my head is jumping around with all the projects I want to start. Logically I don’t seem to have a lot of time and I think focus grasshopper. One project is quite enough quilt to bite off. If I want to actually finish this quilt I am going to have to devote all my attention to this project. Have a great weekend. Sloan has fallen in love with the character Tinkerbell and the latest Disney movie. She only gets to watch it on special occasions, but loves everything to do with that movie. I found this Tinkerbell fabric at Joann’s in the USA. It had Tinkerbell and some of the other fairies from the movie. 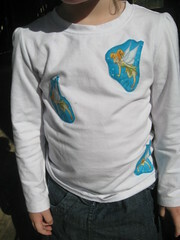 I cut out the Tinkerbells and heat fbonded them onto this shirt and sewed around the fairies to secure them. It is a hit and Sloan gets to take her fairy friends with her everywhere. Anyone else with fairy craft tips, please send them our way!